Enjoy spectacular sunsets, wrap-around views and white sandy beaches from this private 2 BR villa overlooking Ten Bay Beach. With wrap-around decks and porches, gorgeous views, sunny climate and sparsely-populated beaches, Bahama Villa has much to offer newlyweds or small families. Take a short swim out into the protected waters of Ten Bay. The water is always warm, and the diving and snorkeling fantastic! Our lovely home offers peace in a wide open setting. With glass doors opening to the ocean and the bay, you will have a bird's-eye view of Caribbean in all its natural beauty. Here you can dive, swim, rent a boat, go snorkeling, fishing, or just sit inside our central air-conditioned comfort doing nothing except savoring that paperback novel you've saved for just such an occasion. Just allow the gentle Caribbean breezes, along with the sound of ocean waves, birds, frogs and crickets to lull you to sleep at night. Wonderful activities and sights await you throughout Eleuthera. visit any of the dozens of other hidden beaches, the Glass Window and Harbour Island in the North, great restaurants, or one of the many local festivals that always seem to be going on . . .
Come stay for a week. Then keep us for a lifetime! Some snorkeling equipment, floats, tiki hut, BBQ grill, hammock, video library, optional delivery of "home-cooking" from the housekeeper's mother. Lower deck with storage locker for fins, masks, and floats. October 2, 2013 Reviewer: Anonymous From: Chillicothe, MO. I'm a little slow at posting a review due to a hectic schedule but finally, here it is. My girlfriend and I stayed at Bahama Villa the first week of August 2013 and it was amazing. This was our first trip to Eleuthera but I certainly hope it isn't the last. I'm not sure there is much I can say that hasn't been covered by most of the other guests so I will simiply reiterate what they have said. The villa is spectacular for a couple or small group. It was very clean, neat, orderly and everything worked perfectly. Of course the absolute best part is the location. Ten Bay is beautiful, quiet, and what few people we did meet along the beach, all were very friendly. It's located in the middle of the island so you are never too far away from a town or new beach to visit. Since it was our first trip, we attemepted to make the most of our time and see as much as possible from one end of the island to the other. Next time, I will spend much more time at Bahama Villa with limited excursions. If possible, visit the Friday night fish fry in GH and don't miss lighthouse beach. It's a little tricky to get to but very worth it. I could ramble on forever about what a great trip it was but it's probably not necessary as most of the positive reviews ecompass my experience as well. 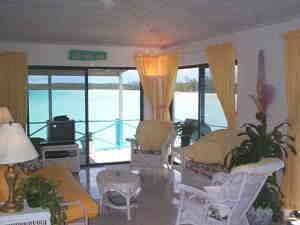 Don't hesitate to rent Bahama Villa, it's worth it and I have every intention of doing it again if the opportunity presents itself. December 20, 2012 Reviewer: Anonymous From: Monticello, Fl. on a private spot to enjoy it all. We come to Bahama Villa/Eleuthera at least once a year, and this past week in September did not disappoint. The villa was spotless when we arrived, the new couches were very comfortable, all bedding was made perfectly, and we were again calmed and amazed by the most perfect view of Ten Bay Beach. There were plenty of fish and lobster to be had, the water was warm, and we enjoyed the high tide "reverse infiniti pool" swimming around the dock. We feel so blessed to be able to return time and time again to Bahama Villa and we can't wait to get back. Even on a rainy day, sitting on the wrap around porch overlooking the water beats any other place I'd rather be. Much thanks and appreciation to the Buckmans for sharing their piece of paradise. the native food good, and the scenery fabulous. Homeowner Response: Great to hear you loved Bahama Villa as much as we do. Eleuthera in 2011 and fell in love with the Island. Homeowner Response: Thank you so much. We feel the same way, we hardly ever leave the house while at Bahama Villa. Hey Emmy, My wife and I had a great time on our first trip to Eleuthera! We really liked Bahama Villa too and would recommend it to everyone. The view from inside the living room looking out over Ten Bay was amazing! The house was clean and comfortable. The kayaks were a “must have” and allowed us to explore the bay from the water. We kayaked over to Kent's Creek and snorkled there. There are pretty fish near a big rock just outside the left side of the bay entrance. This was my first time to snorkel and it was great...like swimming in an acquarium. You can see a whole new world under the water. I recommend visiting Light House beach and snorkel in Light House Bay. The rock road to the Light House is very rough and narrow, 4 miles long and takes 25 min off the paved road but it is worth the drive. Take water, food, a camera and spent the whole day there. Arthur Nixon was very nice. I felt like he would help us if we needed him. 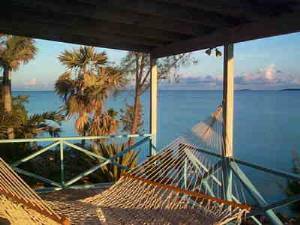 The things we like best about the house were the view (from the deck and 4 sliding glass windows), the location on Ten Bay and central Eleuthera, the house was neat and clean, and dock and kayaks were great! Celebrated are 4th anniversary at the best beach on the island, Ten Bay. We found Bahama Villa to be exactly what we wanted. I was very happy that we found no creepy crawly things lurking inside the villa. Also found it to be the cleanest villa we have ever rented. My only complaint is the dishes are pretty dirty, wash before you serve. After a hard day of relaxing, you will find a very comfortable master bed. The sea life just beneath the villa is amazing. Above water the kayaks are a great way to explore the area. Make sure you get a chance to snorkle, dont forget a underwater camera! We brought our own fishing poles, had a blast catching fish. I fed the Sting Rays every day, beautiful creatures. Very happy we stayed at Bahama Villa! Homeowner Response: sorry about the dishes.They were never dirty for me. Will have them checked. We had such an amazing time staying at Bahama Villa. It was perfect - exactly what we were looking for. The beach was PERFECT for our 17 month old - she had so much fun splashing around and finding star fish. Every day she'd nap for at least two hours, and my husband and I were able to enjoy quiet time right by the water on your dock, with the monitor right by us. I can't tell you how much we enjoyed the quiet and having such a beautiful beach all to ourselves. And seeing sting rays and a shark right at our feet was pretty incredible too! I have traveled a lot and seen many beautiful places, but I have to say my stay at the Bahamavilla ranks to one of my top vacations. The house was clean and well maintained, and the decor was adorable. My favorite part of the house was the balcony; I loved sitting outside relaxing with friends, reading, spotting the fish or just staring out to the sea. I loved waking up to sound of the waves in the morning, and going for run at the beach at low tide. The island was exciting to explore with the breathtaking beaches and views. If you are looking for a spendid vacation in a in larger-than-life beauty, you will enjoy Bahamavilla. We loved our stay at Bahama villa! The property was clean and well maintained and had THE most gorgeous view. Every day we walked down the steps to snorkel in beautiful crystal clear waters with fish so plentiful that you felt like you were swimming in an aquarium. Every night, we sat on the back porch and enjoyed cool breezes and star gazing. It was so quiet and peaceful. We would wake to the most serene setting as we took in the views of the bay from our bedroom....it was very romantic! We stayed in mid-September so many of the resorts were closed. However, it meant we practically had the island to ourselves! Rent a car so that you can explore all of the island. The Glass Window bridge is amazing! We had no problem finding local restaurants open and The Sky Beach Resort had a great infiniti pool bar along with wonderful food. The weather was perfection and so was the view. Your backyard is a tropical island in a saltwater aquarium. The house is in excellent condition and we thoroughly enjoyed our stay. The Kayaks were great! Bahama Villa exceeded all our expectations. Eleuthera was beautiful and the people very friendly. The situation, comfort and facilities offered by BV made for a memorable and relaxing holiday. A beautiful beach, marine life, swimming, snorkeling and kayaking is all literally on the doorstep. To be cherished. The moment we set foot on the deck of Bahama Villa we new that this vacation would be different from any other stay before. We have rented beach houses on the Gulf of Mexico, the North Sea, the Atlantic and the Mediterranean, but Bahama Villa is beating them all. Lay down in the hammock and allow the view to overtake you, you will wish that heaven will be like that. To your right is the well protected 900 yard Ten Bay beach, one of the best beaches of the Bahamas, even during high season peaceful and clean (only a few houses have access to this beach, during our stay we only once saw 15 persons on the beach). In front of you a picture perfect scenery of dark and light turquoise blue sea colors and topical fish swimming visible in the crystal clear water right under your large deck, and left of you: palm trees, coconuts, conch shell, coral rocks and a sun set on the sea horizon as in a dream. 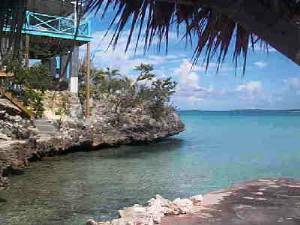 Great snorkeling starts right under the house as the overhanging rocks provide shelter for fish and growth of coral. (it felt like being in a Jacques Cousteau documentary). The house is very private and cozy with good beds,(first class bedding) a living room with a 270 degree view and is well taken care of. The interior has recently been upgraded . The house was very clean!!! The local house manager is very friendly and helpful. The view from the master bedroom with a full moon of the Caribbean Sea is to die for…. You will also find a good collection of books, DVD, detailed maps, and tips and hints on what to do on the island in the house. This villa is unique because it feels as if you are on a boat and the on beautiful the beach in few steps……it is big value for money!!!! We will recommend this house highly and we must return! Paul and Miriam from Crestet, France, staying in Bahama Villa in March 2009. Ps. Before we went we read the comments below and were afraid they were maybe a bit exaggerated, but we can promise you, they are not! My name is Kathryn Bayless, and I and my husband recently stayed at your home in July of 2007. I just wanted to say what a wonderful time we had. Your home was just perfect for our anniversary get away. We saw more sea life from right off the front of the deck than we did the entire Bahamas trip this year and 2 years ago. I just wanted to say thank you so much for sharing your piece of heaven with us. of a vacation here will far exceed your expectations. and dining out to get the full picture. most beautiful place I have ever been! back, hopefully for the first year anniversary! Everyone there was soooo nice and helpful. to get away from the crowds for a while! Homeowner Response: You're welcome Danielle and thank you for spreading the word! We just replaced the AC and upgraded several features, so it should be even better your next trip. Wir verbrachten wunderbare Tage in der Bahama Villa an der Ten Bay. Homeowner Response: Deb and Tom have informed us that their e-mail address has changed. See our main guest page to write Deb Zuczek. this rental is even nicer than the pictures. the view is lovely. peaceful. like being on a boat..everywhere you look in the villa there is water view.the home is bright clean and very comfortable. the wrap around deck is super. the downside is the "no see-ums". also, for those who like "upscale"dining out the offerings are very limited nearby. don't go for "fine"dining. on the other hand, if you like FRESH fish..to buy or prepared at low key restaurants and don't like to dress for dinner or need fine wines served to you it won't be a problem. this island is for those who want lo key, peaceful vacation. 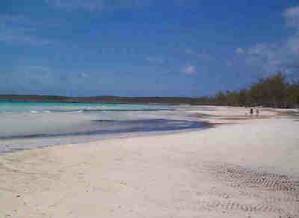 be sure and explore the other beaches listed in the book "elusive beaches of eleuerthera" which is at bahama villa. Homeowner Response: Thank you so much!! Application required (see ...com website). Normal rental period is 1 week, from Saturday to Saturday. Minimum stay is 3 nights, if still available within 60 days prior to arrival. Rates are quoted for 2-person occupancy. Bahama Villa can hold up to six guests at $15/person per night extra. Refundable security fee of $100 and a one-time cleaning fee of $50 due upon booking. All monies refundable before 60 days of arrival, minus $25 processing fee. After that, refunds based on our ability to re-rent the property, then refund is made of the re-rental amount, minus $100 processing fee. Travel insurance recommended for all stays. Deposit: Full payment is due 60 days prior to arrival date. See ...com for details. Cancellations and Refunds: No cancellations within 60 days of arrival unless villa can be re-booked. See ...com for details. Other Fees: $100 refundable security deposit.